Greetings team, and how are you this bank holiday evening? I hope you’ve had the most marvellous bank holiday weekend, full of lovely things! Mine really has been spectacular and so relaxed, so I thought I’d hop on over and do a bit of a bank holiday in doing words post for you all. As I love a nosy around someone else’s weekend, so I’m hoping others will feel the same way about mine! Eating – All. The. Things. The main highlights include a sushi platter from Costco, Doughnut Time doughnuts for a post explore treat and sausage sandwiches. I feel like that’s a nice insight into my foodie weekend for you! Reading – There’s been a lot of reading this weekend, as per on a bank holiday! Firstly I finished Wonder Woman: Warbringer, a Leigh Bardugo novel about my favourite superhero as a teen – I can highly recommend! I also spent a lot of yesterday working my way through the Sunday paper supplements, after all I need to know what’s the must visit holiday destination! 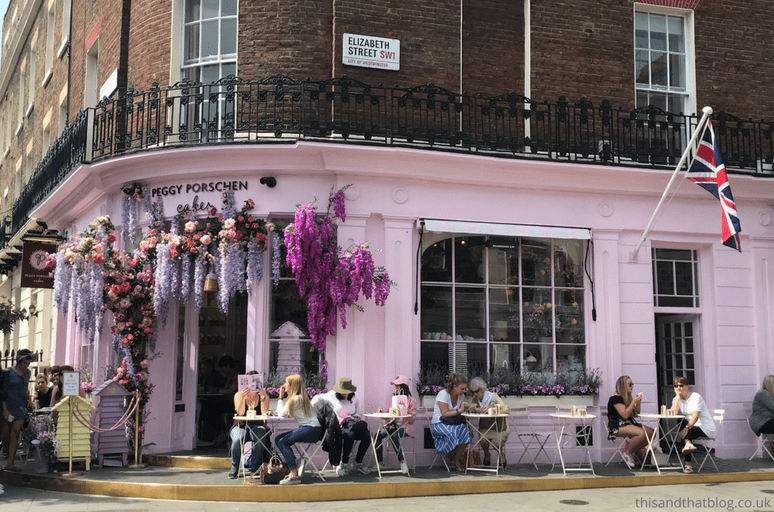 Walking – Today was spent wandering all around London nosing at all the pretty houses in Belgravia and at some of the leftover #ChelseainBloom shop dressings. It was all simply gorgeous. Cuddling – the pupster! Luna accompanied the parents up to our house on Saturday for some serious gardening and after the jobs were done I got lots of cuddles in when she fell asleep next to me. The actual dream. Puzzling – Over the Sunday Times crossword. Again, a standard bank holiday situation. Researching – holiday stuff. It’s just 2.5 weeks before we head to Australia so this weekend has been all about the research. I’ve been looking into the Great Ocean Road part of our trip and what our must-visit places are in Perth. I’m even more excited than I was before now! Updating – my bullet journal as it’s so out-of-date right now. First off I haven’t even started my June pages, and June starts in just three days! Plus it turns out I’ve not updated my books page since January – eek. Considering I’ve read over 40 books this year that’s not ideal, is it? Completing – a new jigsaw. This one was a sewing room themed one and it was super difficult, but also really enjoyable. So yeah for finishing it. Fixing – the hideousness that was our front and back garden. I mean honestly it was a mess. But now the weeds have gone, the unkempt lawn is fixed and the waist-high weeds have been banished. It’s really made all the difference. 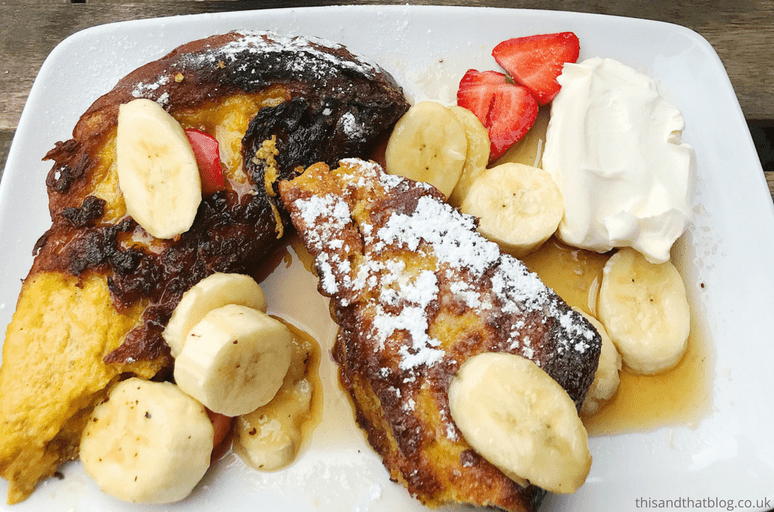 Brunching – Sunday called for a lovely yummy brunch at Brickwood in Streatham. There was french toast with caramelised bananas and strawberries, plus coffee and orange juice. I highly recommend such a situation! Watching – Manhunt: Unabomber. We started this ages ago but it’s only this weekend that we’ve watched it properly – we blitzed five episodes on Saturday and Sunday and I loved it. It’s such a fascinating look at the real-life FBI search for a letter bomber who was caught thanks to linguistic evidence. Definitely a must-watch if you’re into true crime stuff. Buying – all the things for my holiday. On Friday I ordered a striped dress and some t-shirts from M&S and today I purchased the dream lemon print cami top and a new blue ‘bung-everything-in-it’ bag for the plane. Lord knows how much other stuff will get purchased before now and the trip. Send help someone. Please! So there we go, that’s what I’ve been up to this weekend. It’s been glorious!